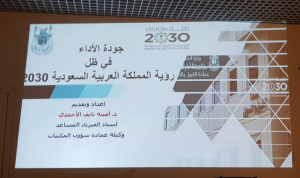 In pursuit of all that would upgrade and promote the performance of its female employees and improve work output under the leadership of its dean His Excellency Dr. Hashem bin Ahmad Al-Samadani, the Deanship of Admission and Registration organized a workshop entitled “Quality of Performance in Light of the Saudi Vision 2030” at the female section for its female employees. This was on Sunday, Sha’baan 27, 1439 AH. 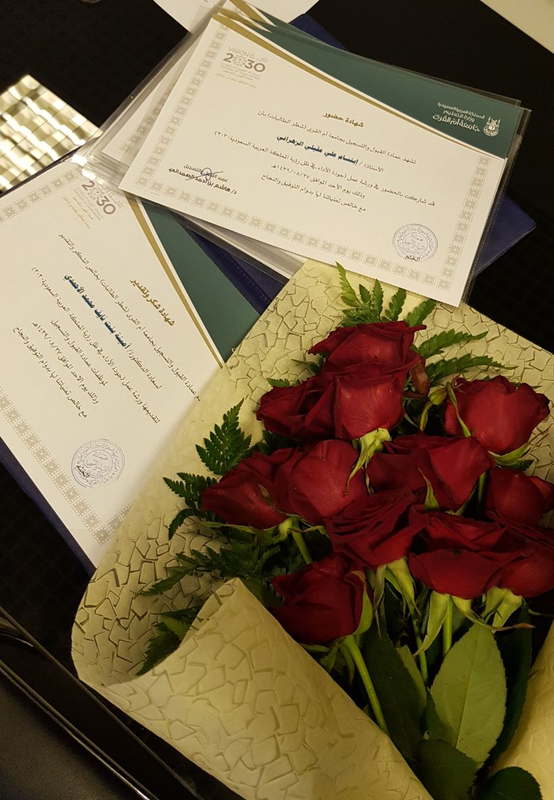 The workshop was given by Her Excellency Dr. Ameenah bint Nayef Al-Ahmadi, Vice Dean of Library Affairs and Certified Trainer in Administrative and Professional Development. Dr. Al-Ahmadi started the workshop with an introduction of the Saudi Vision 2030 and its most significant indexes. She explained that enhancing the quality of performance is based upon three focal areas: Saudi Vision 2030; job performance management in accordance with King Salman Program for Development of Human Resources; and quality standards of the National Center for Academic Evaluation. She also talked at the end of the workshop about how to draw up a sequential track for career objectives for female employees to contribute to achieving the Saudi Vision 2030 and linking objectives to the Deanship’s vision and mission first; then to the University’s vision and mission; and finally to the vision and mission of the Ministry of Education. At the close of the workshop, Her Excellency Dr. Fatmah bint Ali Al-Ghamdi, Vice Dean of Admission and Registration, expressed her thanks and appreciation to Dr. Al-Ahmadi for her efforts in giving the workshop. She further expressed her appreciation of the keenness by the female employees of the Deanship on attending such workshops.